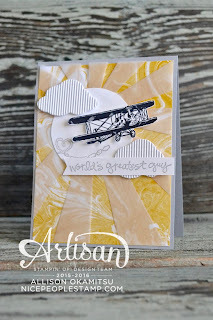 Welcome to the Crazy Crafters Blog Hop with our Special Guest stamper, Allison Okamitsu - we are thrilled that Allison said yes to playing along with us this month! This month we are excited to CASE (Copy And Selectively Edit) any project that has been created by Allison and we hope you find great inspiration from the projects. This is the card I eventually chose to CASE. I found so much inspiration on Allison's blog that it was difficult for me to narrow it down! I really liked the idea of using a vellum die cut sunburst to add an additional subtle layer of interest to a card. In the case of my card, it also served to tone down the pattern on the DSP I used for my background. Click on the image of Allison's card to link to her blog. I used the same concept with the vellum and similar layout to highlight a Blended Bloom that I had been watercolouring. I stamped the banner from the Bloomin' Love set in Basic Black and added a Teeny Tiny Sentiment in Rose Red. I trimmed the vellum sunburst to the same size as the DSP layer and adhered that to a Basic Black layer before adding it to the front of the Rose Red card. 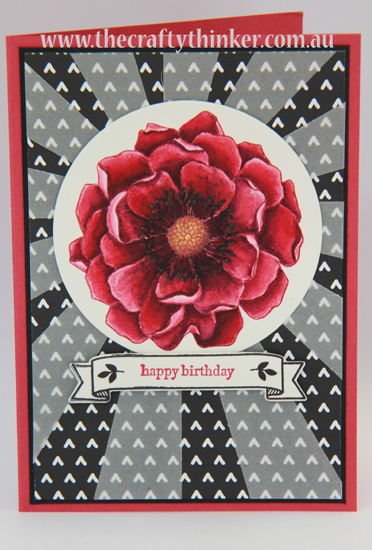 I stamped the Blended Bloom onto Shimmery White cardstock with Rose Red ink. My first step was to colour in the stamens with a Basic Black Stampin' Write marker, so that I didn't "lose" them! 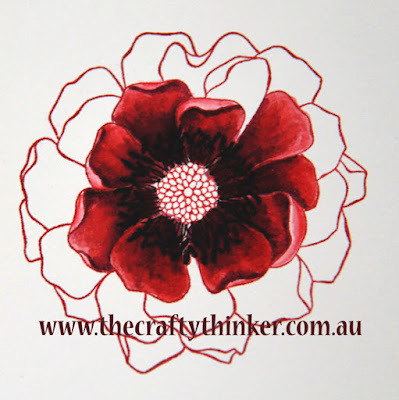 Working one petal at a time (making sure any adjacent petals were dry), I watercoloured the flower with Rose Red and Elegant Eggplant inks. I used the purple to add the deep shadows. For the highlights, I left the white of the cardstock showing. I like to use ink from the refill bottles (I just squeeze a few drops into the lid of the relevant stamp pad) so that I can more easily control my ink/water mix - which affects the depth of colour I add. I painted the centre of the flower with Gold Wink of Stella and added a few dabs to the stamens for highlights.